Bavarian motor works (bmw), a major manufacturer of motorcycles and airplane and truck engines, acquired the dixi automaking firm in october 1928. With the company came the dixi 315, a tiny car built under license as the german version of the austin seven. The dixi became the first automobile to bear the bmw badge. Teutonic seven production of the 315 began in december 1927, with the da (deutsche ausfiihrung, or german version) label indicating the cars links with the austin seven. Built on a 76-in. Wheelbase, this pygmy weighed little more than 1,000 lbs. In july 1929 it became the da2, which had a new grille and modified body. Until 1931, when it received fourwheel foot brakes, the 315 had a brake lever for the front wheels and a pedal for the back ones. The 315 wartburg roadster won many races, including a class win in the 1929 austrian alpine trial. small car, small engine the da3 sports model, introduced in 1931, had the same small side-valve four-cylinder- engine pushed to 18 hp. The da4 of 1932 had independent front suspension, but the first examples were erratic in steering and handling. A total of 15.948 bmw dixi 315 automobiles were made before bmw withdrew from its licensing agreement to launch the new 320. 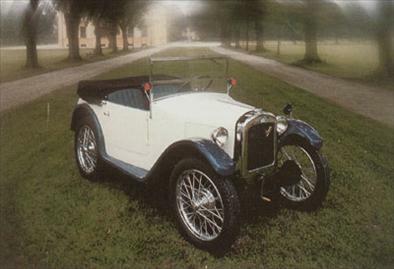 The first car to cany the bmw badge, the dixi 315 was the german version of the austin seven.